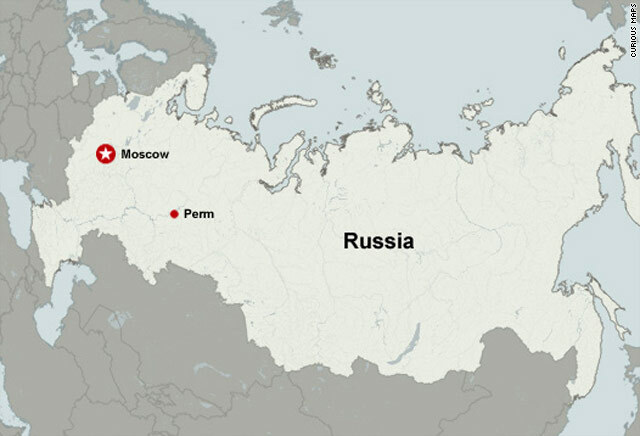 Moscow, Russia (CNN) -- Russian investigators on Saturday picked through the remains of a burned-out nightclub and detained at least five people in the aftermath of an explosive inferno, the result of an alleged misuse of fireworks that claimed more than 100 lives. Friday night's fire -- in the Ural Mountain area industrial city of Perm -- swept through a party in full swing at the Lame Horse, a local nightclub celebrating its eighth year in business. The blast and fire engulfed the club, law enforcement officials said, as a performance artist juggled cold-flame pyrotechnical maces. As he threw them high in the air, the club's ceiling caught fire and almost immediately spread on to the wooden walls, cutting off exits. People succumbed to smoke inhalation or were trampled attempting to escape the panicky chaos. The latest death reports varied, with one count as high as 109. Around 130 people were injured, authorities said, with dozens were in critical condition and many of them hooked up to artificial lung ventilators. Authorities have opened a criminal investigation. The Investigative Committee of the Russian Prosecutor's Office said several people have been detained: two club co-owners, a club manager, the night club art director, and a businessman who provided the fireworks and is now suffering from burns at a hospital. "A lot of people were lying on the floor of the club," according to one young female witness. "Those of them who breathed were carried out and put in cars. The biggest problem was that each ambulance took only one person. They didn't take any more. We were yelling at doctors, forcing them to take more people at once." Igor Goncharov, a Perm municipal official, said city workers were helping distraught relatives, who wanted to know the fate of their loved ones. "We work with the victims' relatives here. We give them the information about people who are in hospitals and those who were found dead and recognized by the forensic bureau," Goncharov said. Shocked residents placed flowers outside the burned club in memory of the victims, a scene that brought back memories of two other Russian deadly club fires -- one in Moscow in 2007 and the other in Omsk in 2008. The tragedy startled Russians, reeling after last week's derailment of a luxury express train from Moscow to St. Petersburg. That incident -- which killed 26 people and injured more than 100 others -- has been called a terror attack, the most lethal terrorist act outside of Russia's troubled North Caucasus region since 2004. But this latest nightclub accident, in the Russian heartland around 900 miles east of Moscow, is believed to have been caused by what one Russian official says was the "unsanctioned use of pyrotechnical devices." "The breach of technology while setting off a firework was the cause of the accident," said Vladimir Markin, a spokesman for the Investigative Committee of the Russian Prosecutor's Office. "It was not a terrorist act." In a televised address from his country residence near Moscow, President Dmitry Medvedev demanded that those responsible for the accident get the harshest possible punishment. He sent government officials to Perm to handle the aftermath of the accident, organize medical assistance to survivors and investigate. Prime Minister Vladimir Putin dispatched two planes from Moscow equipped to carry people with extensive burns.